While I had always wanted a Mercedes convertible of the kinds made from 1972 to 1989, I didn’t get a chance to buy one for myself until 17 years after they had stopped making them. For more pictures of this car, I will soon include a gallery page of thumbnails with a link here. 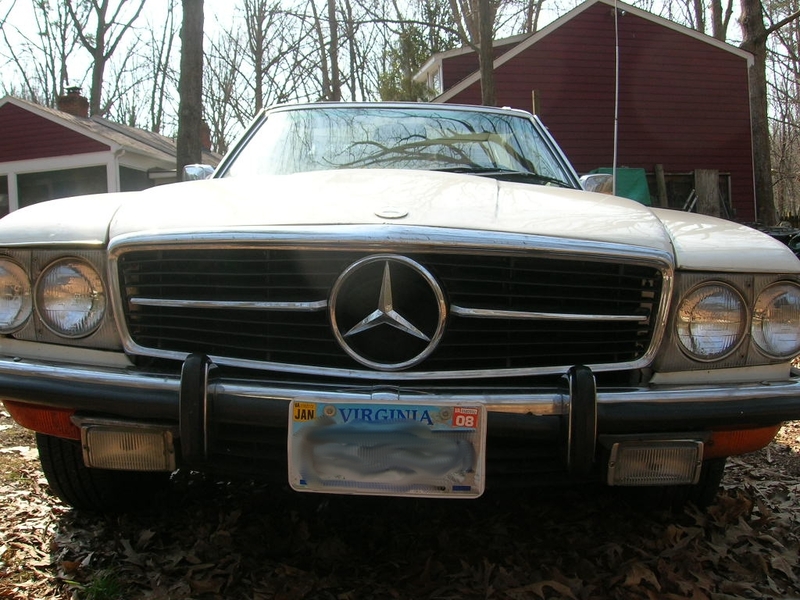 A friend of mine, in Charlottesville (a little over an hour away) had a 1977 280SL I had known about for years. She had promised me first refusal if they ever were to sell it. She called me and asked if I was interested. Of course! I drove up in Ol’ Faithful (my 1988 Jeep Comanche pickup that could make it to hell and back) and drove back in her 280SL while she and her family used the truck. I test drove it for the weekend and took it in to a mechanic for a pre-purchase inspection that Monday. If you don’t know what a pre-purchase inspection is, or haven’t done one, it’s what it sounds like: an inspection of a car before you buy it. I don’t mean a state inspection. (In Virginia, all vehicles have to be inspected once a year and meet certain safety requirements. Cars over 25 years old can opt out by using antique plates, but in doing so are restricted to only 2,500 miles of travel a year, only to and from car shows and repair shops.) I mean a full inspection for rust, safety, wear, and so on. I could not imagine buying a car without one. If you’re ever planning on buying a used car and the seller won’t allow an inspection, walk away. They’re hiding something, which means you have no idea how much it will cost to fix it. My friend’s car seemed in good shape. The engine was in wonderful condition. As soon as the mechanic put it on the lift and raised it up, though, it was easy to see a LOT of rust. I could restore the interior and keep the engine going, but when there’s a lot of rust, it’s an uphill battle. This is the one thing that can kill a classic car. The mechanic didn’t have to persuade me. I could see it. By chance (really? 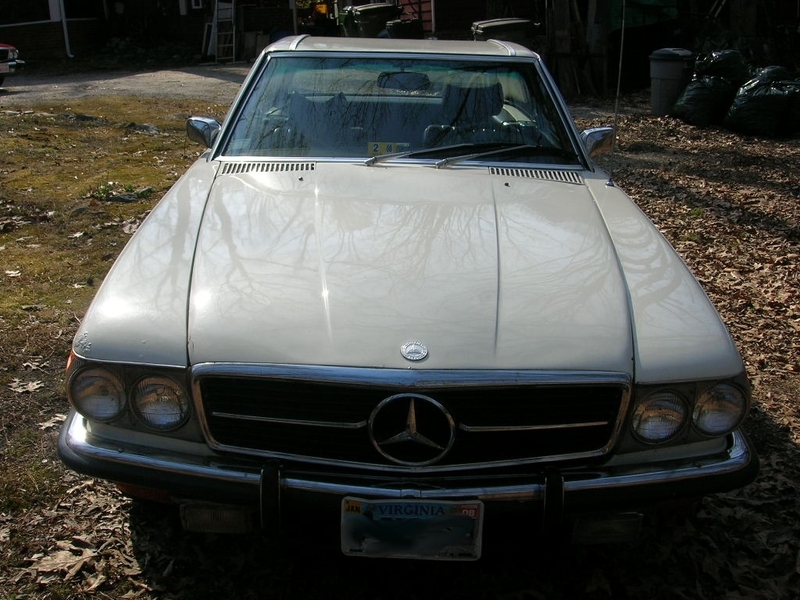 ), he had a 1973 450SL for sale and I test drove it a few days later. I turned down my friend’s car (and yes, we’re still friends) and bought the 450SL because it seemed to be in quite good shape. One major difference is that the 280SL, imported from Europe, had a fabric interior, which wore much more quickly than the interiors on the other cars. It was much easier for the 280SL to look worn than the 450SL. I bought the 450SL from the mechanic. Overall it was in good shape. It passed the the state inspection and I took it home. Then I started running into problems. I’m not talking frightening problems like the engine falling out from rust. The firs one was my fault. I’ve never owned an automatic before. I backed it out of my garage (after I got it home, of course), and stopped it to go over the car and it would not start again. It sat out in my driveway for 3 days before I got it going. Nobody ever told me an automatic shift car had to be in Park or it would not start. Such a small thing, but very frustrating. I had been trying to start it in Neutral! Then it wasn’t long before I had to start taking it into the shop. When I looked the car over at the lot, the wipers were not working. The mechanic told me all I had to do was replace the wiper motor. This leads to a major lesson in used cars. When a mechanic says a problem is simple and has not fixed it, he very well may know there’s much more to it. In this case, I found and installed a wiper motor. The motor worked, but the wipers did not. A few weeks and $1,800 later, I had working wipers. The wiper transmission had to be rebuilt. It was so rusty the old one could not be completely removed and the mechanic I had taken it to (not the one that sold it to me) said he had to rebuild the gearing in place, using the good parts of the old one and as much as possible of the new one. Then there was the engine trouble. First it was a basic tune up. Then a month or two later it was another $300 or more to take care of timing problems. But it was finally running well and kept running well for the summer, before the fender got dented. New lesson for me to learn: few body shops work on classics. The ones that do fit it in between other jobs. The 3 day job took them 6 weeks to finish. Most of the fall, when it was nice and cool and perfect convertible weather passed with the car in the shop. I wish I had started blogging this when I bought the car. I learned a lot about cars with this 450SL and a lot about dealing with mechanics. There were frustrating times, odd incidents that are funny when I look back, and quite a number of opportunities for me to learn something new and do new work on a car. Then, a week ago, thanks to a tree falling on my truck (so much for Ol’ Faithful that had gone through anything I needed it to go through for 18 years), I realized I needed a car I could be sure would work every day. It was time to sell the 450SL and find a car I could count on. Fortunately, before selling the 450SL (it is still mine as I write this), I found the perfect classic car. This entry was posted in 1973 Mercedes 450SL, Classic Cars. Bookmark the permalink. 1. work on the mechanical parts of a ’73 450SL? 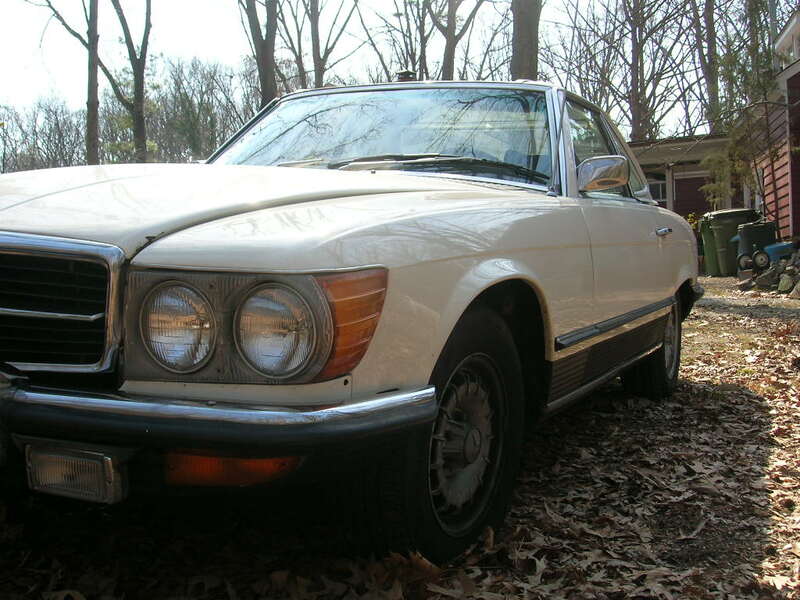 2. install a new convertible top on a ’73 450SL? Hmmm. You’re the second person today to ask me about a ’73 450SL. The first was someone who was looking at buying the one I used to own. Any chance you’re talking about the same one — were you looking at buying it or is this one you’ve had? I take my 380SL to Mercedes Benz Imports, or M. B. Imports on Research Rd. I can highly recommend talking to Roger there. I don’t want to post a phone number on the web, so I’m going to email it to you directly.